Dorm wall art is one of the most important parts of completing your dorm room decor. Your college dorm room walls aren't very inviting when you first move into your college dorm room. The dorm walls are going to be a little bland and detract from your dorm room decor, so you want to make sure you add some wall decorations for dorms of your favorite bands, movies, and - of course - scenic views! Scenic views are amazing college posters that will add something a little different to your college wall decor. When you think of scenic views of New York City, you probably think of the famous skyline. However, our New York Umbrellas Dorm Room Poster will add a unique piece of dorm wall art to your dorm essentials that you will love! Our New York Umbrellas Poster for dorm rooms is a great addition to dorm room decor. This dorm necessities item features a busy New York City street instead of the skyline that is on every college poster of New York City. 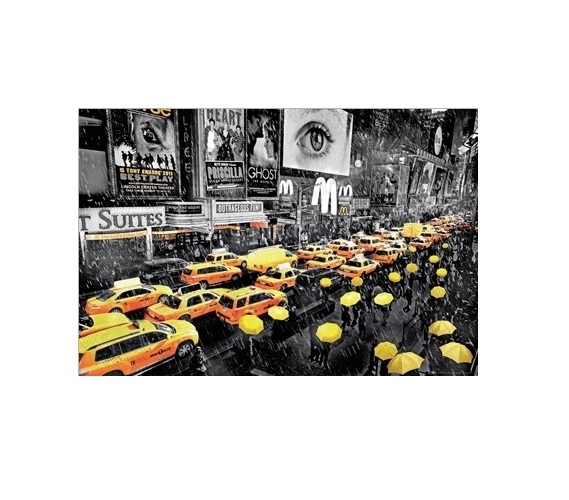 The unique view of this college supplies item features a grayscale photograph of a busy New York City street in the rain. In the backdrop of this busy city street are Broadway posters, but one of the most stunning features of this cheap dorm supplies item are the yellow highlights. In the foreground of this college supplies item are taxi cabs and umbrellas highlighted in yellow to give an even more unique flair to this dorm room decorations item!